We all know about the wildfires that are currently devastating the stae of California, and the tragic levels of damage that they have wreaked upon entire communities. What people don’t always see is the stories of the heroic everyday people who are putting their lives on the line to help those who are vulnerable. 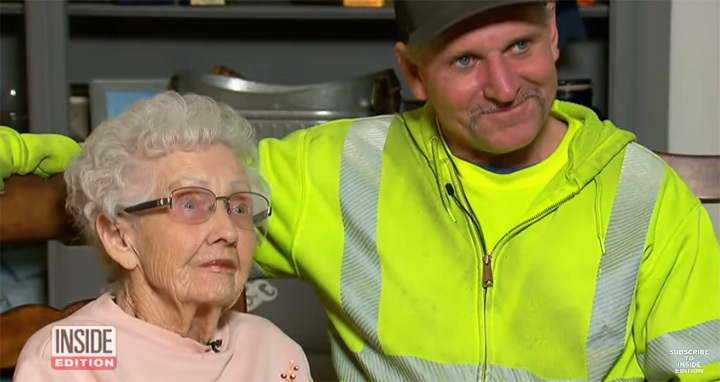 A waste disposal man in California rescued 93 year-old woman by the name of Margaret Newsum, who was stranded in her home as vicious wildfire swept through her country. Residents in the area were ordered to evacuate on Thursday as the wildfire quickly turned into an inferno, but unfortunately the 93 year-old had no way of getting out. As hundreds of residents were fleeing the fire, Dane Cummings was doing the exact opposite – driving toward the flames. Why? Because he was so worried about the many senior residents that he’d passed for years along his route, many of whom he’s come to know, and worried would not be able to get out on their own. And as it turned out, he was right – his help was needed. “I been on that route eight years, and I just picked the people that I knew were older, and I tried to stop and help them and let them know that they were coming and make sure they were getting out,” Cummings said. What a thoughtful, selfless man. It just goes to show how emergency situations can bring out the best in people. It’s such a blessing that Dane came back, too – with no family in the area and her caregiver gone for the day, Margaret Newsum was just sitting on her front porch, hoping someone would drive by and see her. “So here comes this great big green monster down the road,” Newsum said, recalling how relieved she was to see a vehicle approach. Cummings slowly loaded her into his truck, making sure she boarded safely. As soon as she was in the car, they raced off to safety as the flames tore through town. We’ve covered similar stories recently, with other residents of California driving head-first into danger to help out those who needed it. We can’t thank you enough for your incredible compassion and generosity – you guys are truly what makes this country great. God bless you Dane, you’re a true American hero.